Inside: The tastiest butternut squash appetizer recipe for the best game day potlucks. Game day is coming up and I am so ready for all the hosting and being hosted that game day bring along with them. 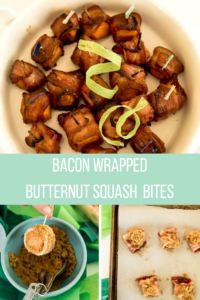 The bacon wrapped butternut squash appetizer is one of my favorite apps for serving guests or bringing along to friends’ homes. It is a cinch to pull together and EVERYONE, I mean EVERYONE, loves it. 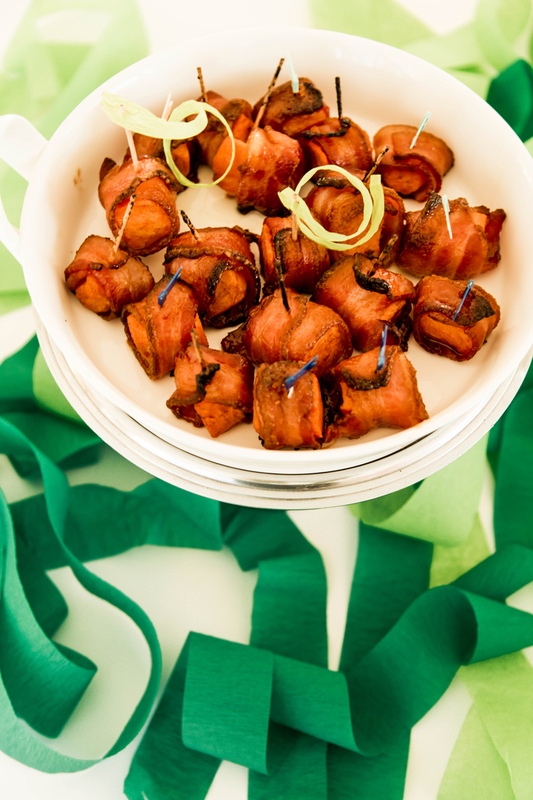 The sweetness of the syrup sauce covering the sweet potatoes melds with the crispiness of the bacon to create a party in your mouth that you will reach for again and again. Having great bacon is essential to this dish coming out in the best way possible. 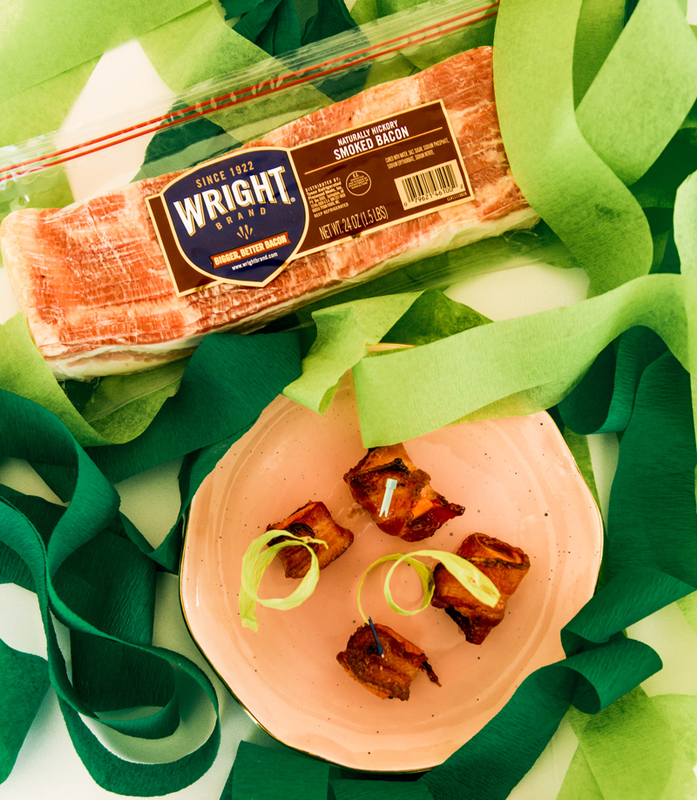 I’ve tried a lot of bacon in my life and Wright® Brand Bacon is by far our favorite. 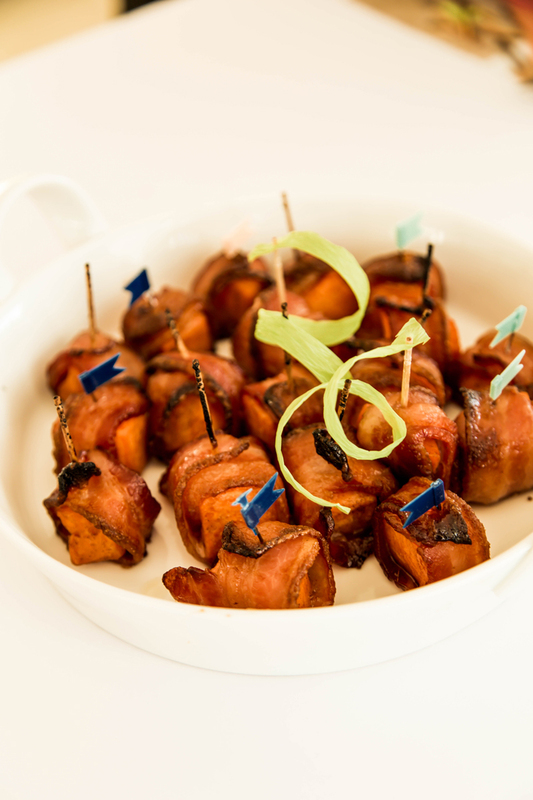 Especially for our bacon wrapped butternut squash appetizer. It is thick and feels gourmet, but sold at an affordable grocery store price. To make the bacon wrapped squash bites start by heating the oven to 400 degrees. While doing that, soak the toothpicks in a bowl of water and lay out on a paper towel to dry. Mix the butter and all the spices in a large bowl, add the squash and toss to fully coat. Take each squash and wrap in ½ piece of bacon and secure with a toothpick. 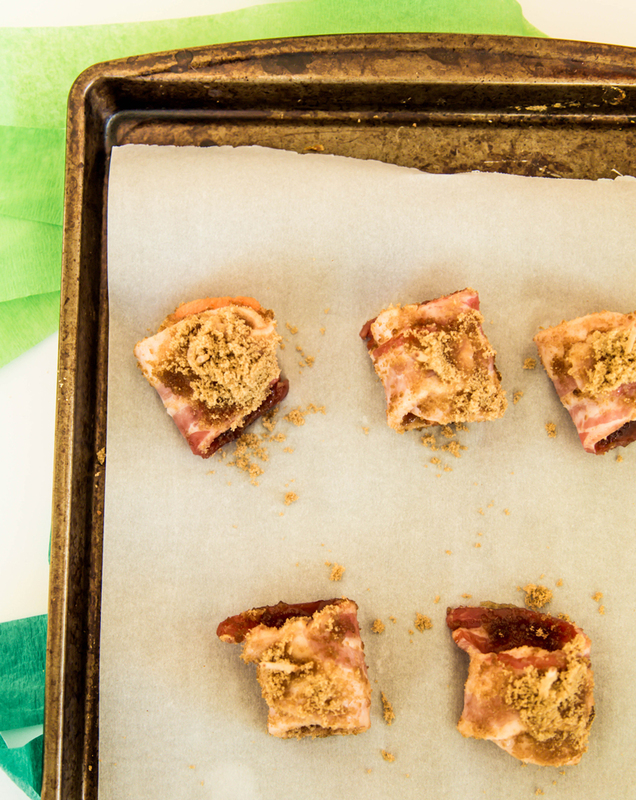 Dip into the brown sugar and place on a lined baking pan. Bake in oven for 40-45 minutes, until the bacon is crisp and the squash is tender. Once the bacon wrapped squash bites are done, remove and let cool. We like to change out some of the toothpicks for fun game day flags to add a little extra party flair. To make the game day flag toppers, take a small length of paper crepe streamers in your favorite team colors and cut to about 6 inches long, then cut 4 times each vertically and watch the paper spiral around for a festive appetizer topper. Secure with tape to a toothpick and trade out for the oven baked one attached. When it comes to game day, is there ever really enough goodies to be had? I don’t think so! Here are a couple more of my favorite go-to game day goodies! Let us know in the comments what your favorite go-to snack is! This could work for any big game day coming up and is sure to elicit the same excitement from everyone you know. Even those of us who don’t do all the cooking things well can score a touchdown with a dish like this. I’ve learned you really only need a couple killer party dishes that you nail for everyone to think you really do know your way around the kitchen. This is definitely one of those dishes. 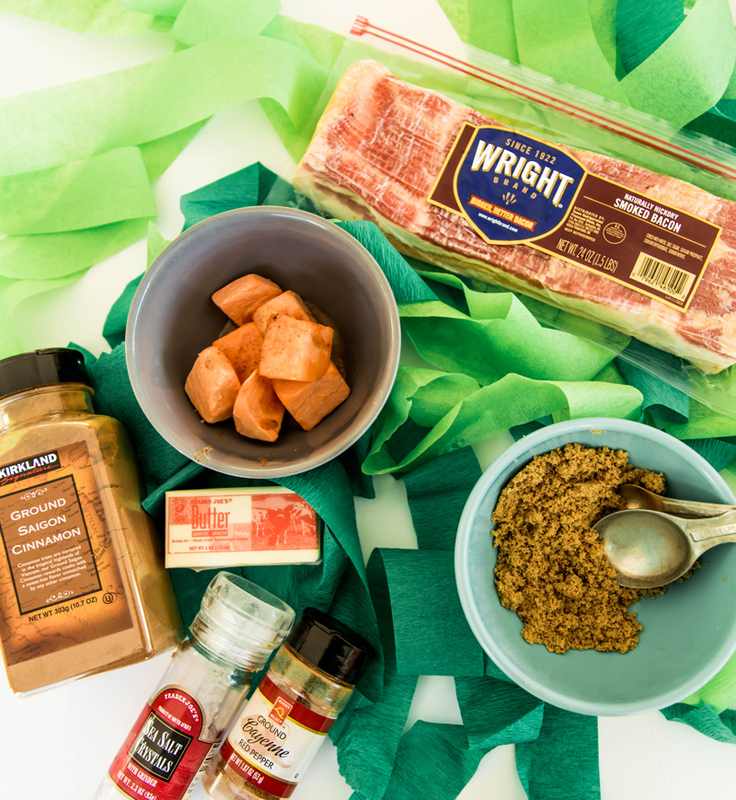 It is really all about the quality ingredients and we are thrilled to partner with Wright Brand Bacon and encourage you to grab some to try from your nearest Kroger store. I would love to hear how the dish comes out if you try it at home. 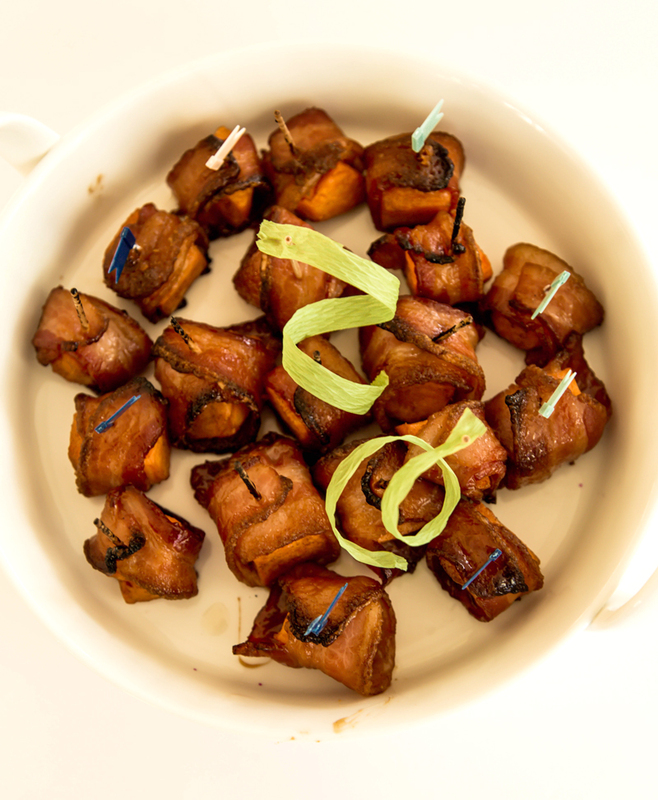 This bacon wrapped butternut squash appetizer can be made 3-4 hours ahead of time and be stored in the fridge. All you have to do when your guests arrive is pop them in the oven. fPS. 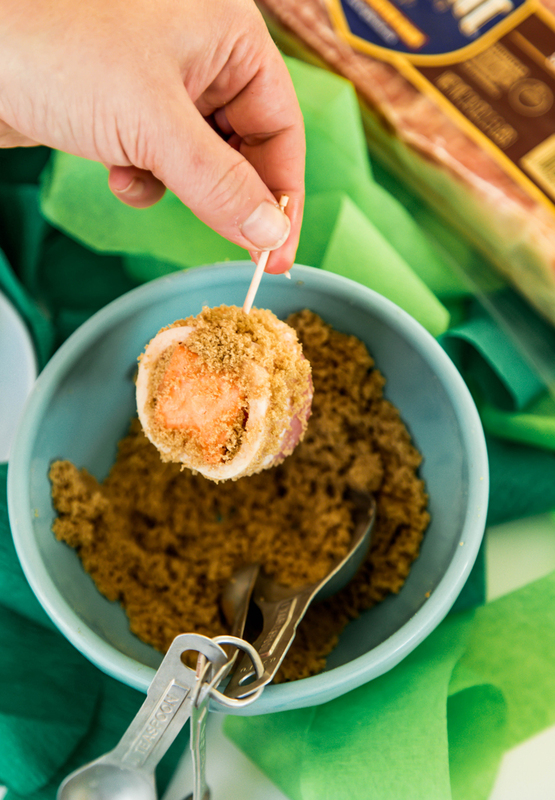 A few other game day favorite ideas right here. (Photography @ASubtleRevelry by Ashlyn Savannah Photo).